(From Nikon lens literature) The new AF-S NIKKOR 800mm f/5.6E FL ED VR super-telephoto lens provides professional photographers the opportunity to get close to a subject with the longest fixed focal length lens in the NIKKOR family. Designed for the needs of sports, wildlife and news photographers, the 800mm features a maximum aperture of f/5.6 and gives FX-format photographers the chance to capture intense detail and textures that fill the frame from a distance. Included with the new lens is the matched AF-S Teleconverter TC800-1.25E ED which has been developed exclusively for the 800mm f/5.6 lens. This is the first Nikon teleconverter to employ an ED glass element, and extends the maximum focal length 1.25x to 1000mm (1500mm when used with a DX-format camera) and maximum aperture to f/7.1 while maintaining full AF performance on D4, D800 series and D600 FX-format D-SLR cameras. Originally trialed and tested under the demanding conditions of the 2012 summer games, the AF-S NIKKOR 800mm f/5.6E FL ED VR maintains the handling, optical performance, vivid color reproduction and exceptional clarity that professional photographers rely on. This is the first Nikon lens constructed with two fluorite glass elements, combined with two ED glass elements and a Nano Crystal Coat, to help ensure outstanding performance with minimal chromatic aberration and flaring, all within a durable lens body. The addition of fluorite elements allows for consistently excellent optical characteristics while keeping the lens balanced and lightweight. The lens is comprised of 20 elements in 13 groups, and is one of few Nikon lenses to utilize an electromagnetic diaphragm mechanism that enables seamless mechanical control and enhanced stability in auto exposure control during continuous shooting. Vibration Reduction (VR) image stabilization is also implemented, with the equivalent of approximately four stops faster shutter speed correction. 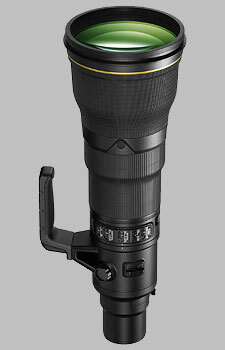 The Nikon 800mm f/5.6E FL ED AF-S VR Nikkor doesn't have any user reviews yet!